Good morning Kentucky and happy Monday! I hope you all had a great weekend. We have a mild week ahead with increasing rain chances toward the end of the week. Temperatures are in the mid-30s and the roads are clear. Your morning commute should be chilly and dry. Today is going to be sunny and the winds will be calm. Temperatures will heat up into the low-50s today. A high pressure system will be overhead, which will be keeping conditions clear today. No precipitation chances for today and into tonight. The temperatures are going to drop into the high-30s and patchy fog is expected, as well. Fog is formed when the air temperature cools down to the point of saturation. The dew point temperature is the temperature at which the air will reach saturation. The saturation in the atmosphere will result in tiny water droplets that we call fog. During the early morning hours, the air temperature (red line) and dew point (green line) are nearly the same value. Since the temperatures are so close (blue box), patchy fog is expected. Tomorrow is going to be a similar story. The high temperature is expected to range right around 50°F. The skies will be a tad cloudier than today. Those clouds will clear up as the temperatures cool to the low-30s at night. Wednesday is going to take on the greatest warm up this week. 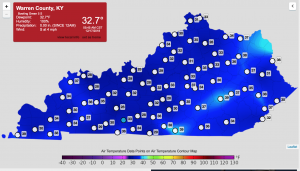 The temperature is expected to increase into the low-50s. Wednesday will be another sunny day with calm winds. A cold front extending from a low-pressure system will be sweeping through on Wednesday night. Rain chances are going to start increasing in the evening. The temperatures will also decrease into the mid-4os. Slightly warmer temperatures and sunny skies will start us off this week. A high-pressure system will keep the winds calm and cool for our area. However, a low-pressure system will be moving in on Wednesday, which will create some precipitation chances for South-central Kentucky. That is all I have for today’s forecast. Make sure to keep updated with the latest weather conditions by following @wxornotBG on Twitter. You all have a great day!